‘Avengers: Infinity War’: Who Is Ross Marquand Playing? Warning: This post contains one minor spoiler for Avengers: Infinity War. [I]t’s not something I would want to do again. I’m glad I did it. I did sign up for a number of pictures and I suppose, contractually, I would be obliged to, if they forced me to, but they wouldn’t want to force someone to do it, if they didn’t want to. I think I’ve done my dash with that sort of film. It was good to do it and try it out, but to be honest, it’s not the sort of film I seek out and really am excited by. Which is why it might be surprising when, midway through Infinity War, Red Skull does indeed make his grand reappearance in the MCU. (I won’t spoil exactly how or why.) Has Weaving had a change of heart? Check the film’s credits, and you’ll discover … no! 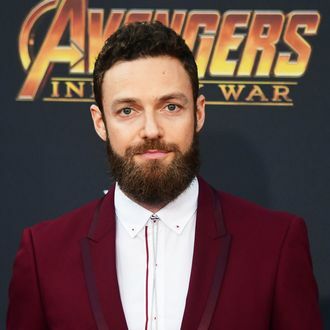 Instead, the role of Red Skull has been recast with actor Ross Marquand. If you’re a fan of The Walking Dead, you’ll know Marquand as the affable, out Aaron, but it’s his non-zombie sideline that gets the most workout in his brief appearance in Infinity War. Over the years, the actor has frequently gone viral with his string of “celebrity nano-impressions” — split-second scenes like George Clooney trying to get a word in, or John C. Reilly winning an Oscar. Is it fair to say that Marquand’s Red Skull performance is just him doing a Hugo Weaving impression? I think so. (I’d say it’s the world’s best Hugo Weaving impression, but there was a kid at my middle school who was amazing at saying “Mr. Anderson.”) In any event, this casting is proof that sometimes, charming late-night segments can lead to big Hollywood work. Someone get Amber Ruffin in Aquaman!